Hello and Welcome to Inspire, Create & Share's Fall Fun Blog Hop! If you have already been hopping, you should have landed here from the awesome blog of Joni Metras and I would like to thank you for continuing on! If you've started here, please make sure you click the Next button at the end of the post for some awesome Inspiration by our Bloggers! 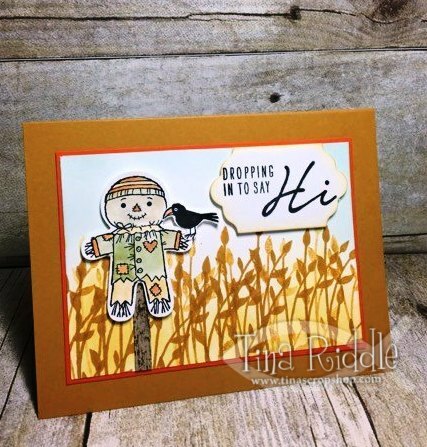 I decided to use my Cookie Cutter Halloween set for this card but I wanted a field of grain for my scarecrow to stand in and of course, he needed a pole! For my grain, I used one of the stamps from Jar of Love and stamped it in Delightful Dijon both in full color and in second generation stamping. I also alternated stamping on and off the cardstock so that it was different heights. After stamping, I sponged some Daffodil Delight Ink onto the bottom portion of my Whisper White layer. I also sponged some Soft Sky Ink onto the top portion of this layer lightly in the middle and darker around the edges. I made my pole by stamping the woodgrain from the Timeless Textures stamp set in Soft Suede ink onto Crumb Cake Cardstock. I then cut a strip at about 1/4" wide x 3" long for the pole . I adhered it to my stamped layer with fast fuse. I stamped my Scarecrow and Bird onto Watercolor Paper with Black Archival Ink. I then watercolored the scarecrow with Old Olive, Tangerine Tango, Delightful Dijon, Crumb Cake and Pumpkin Pie ink. I punched him out with the coordinating Cookie Cutter Builder Punch. I fussy cut the bird and then attached them both with Stampin' Dimensionals. I stamped the sentiment from Acorny Thank You in Black Archival Ink onto Whisper White Cardstock and cut it out with the Lots of Labels Framelits Dies. I sponged the edges of it with Daffodil Delight Ink and adhered it with Stampin' Dimensionals as well. Next up on the Hop is the fabulous Tammy Dunlap. Just click the Next button and you'll be there!